Possibly private collection, Germany ; with Galerie Georges Petit, Paris ; with Galerie Bernheim-Jeune, Paris ; Wilhelm Hansen (1868-1936), Ordrupgaard, near Copenhagen, by c. 1918 and possibly as early as 1916 ; sold to Baron Kojiro Matsukata (1865-1950), Paris and Kobe, Japan, March 1923 (as "Le village de Moret") ; offered by him for bailout of his company, Kawasaki Dockyard, Co., Ltd., Kobe and then seized by the Jugo Bank, Tokyo, 1927; Hōraishokusan & Co., Tokyo . Wildenstein & Co., Paris and New York ; sold to Charlotte Dorrance Wright and William Coxe Wright, St. Davids, Pennsylvania, April 30, 1957, until his d. 1970 ; Charlotte Dorrance Wright; bequest to PMA, 1978. 1. According to a note in curatorial file, with no source listed. 2. 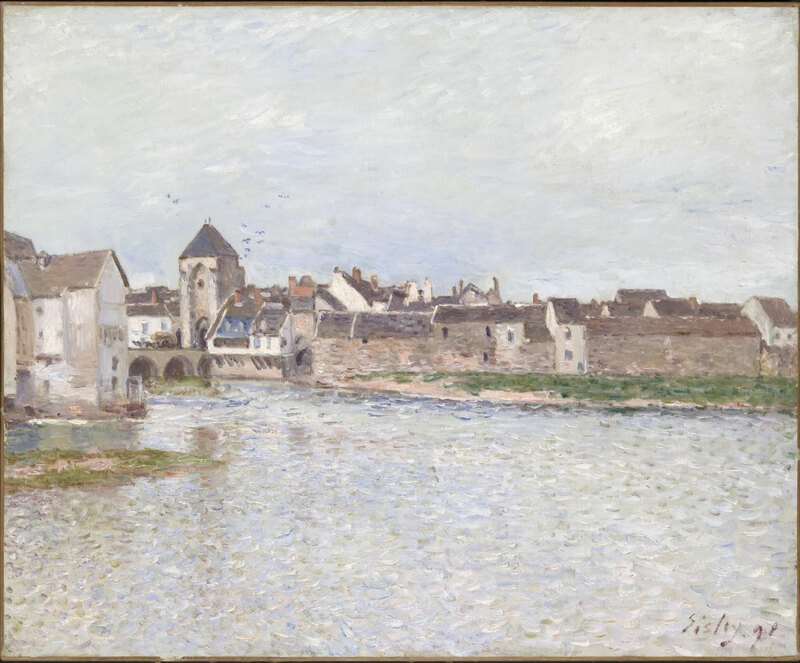 Information from Frick Art Reference Library Photoarchive, Sisley, “Le Quai du Loing à Moret.” 3. François Daulte, Alfred Sisley: Catalogue raisonné de l'oeuvre peint, Paris, 1959 (no. 779). 4. See Marianne Wirenfeldt Asmussen, “Wilhelm Hansen’s Original French Collection at Ordrupgaard,” 1993, no. 89 (“Byen Moret/The Town of Moret/Le quai du Loing à Moret”), p. 278-9, with gallery installation views of the painting at Ordrupgaard dated c. 1918 on pp. 20, 22; note that the current owner is listed incorrectly as “private collection” (p. 49). The catalogue indicates that Hansen acquired the painting from Bernheim-Jeune. Wilhelm Hansen, Danish insurance magnate, and his wife, Henny Hansen, formed a collection of French Impressionist paintings between 1916 and 1918. The Hansens moved into their home, Ordrupgaard, in 1918 and opened the French Gallery to the public once a week. Hansen suffered a financial crisis in 1922 and was forced to sell a significant portion of his collection to pay debts. 5. Correspondence at the Bibliothèque centrale des musées nationaux, Paris, records that negotiations for the purchase from the Hansen collection began in December 1922, and were concluded by March 5, 1923, with Hansen selling the painting to Matsukata for 35,000 fr. (MS375 Fonds Léonce Bénédite, courtesy of Megumi Jingaoka, Curator, National Museum of Western Art, Tokyo; copies in curatorial file. See also Asmussen 1993, p. 278). The sale was arranged on Matsukata's behalf by Léonce Bénédite (1859-1925), a founder and curator of the Musée Rodin, and Seiichi Naruse (1892-1936), a Japanese scholar of French literature who assisted Matsukata with the formation of his collection. The works from the Hansen collection purchased by Matsukata were delivered to the Musée Rodin on March 30, 1923. Matsukata formed his collection of modern French art, particularly Rodin, from 1916 to about 1935. After 1921 most of the artworks that he bought in Paris were stored long-term at the Musée Rodin awaiting the construction of Matsukata's proposed museum of Western art in Japan (see Haru Matsukata Reischauer, Samurai and Silk, London, 1986, p. 290-297, and Christina Buley-Uribe, "Matsukata et le musée Rodin: avatars d'une collection," in Rodin et le Japon, Tokyo, 2001, p. 87-89). Matsukata’s plan to establish a museum to house his collection in Japan was disrupted by the economic crisis of 1927, in which Kawasaki Dockyard’s major bank collapsed. Matsukata resigned as president and was forced to dispose of his own property to sustain his company; the artworks he had brought to Japan were sold in a series of auctions during the following years and dispersed. The collection remaining in France was sequestered by the French government during WWII as enemy property. Most was eventually repatriated to Japan in 1959 where it became the core of the National Museum of Western Art in Tokyo; a portion was retained for the French national collections (see https://www.nmwa.go.jp/en/about/matsukata.html). 6. The preceding provenance information courtesy of Megumi Jingaoka (communication of Feb. 16, 2018, in curatorial file). The Jugo Bank was the largest creditor of Kawasaki Dockyard Co. The Sisley was displayed in the exhibition in 1947 as a work lent by Hōraishokusan & Co., Tokyo, which was a company created to dispose of the Jugo Bank property in 1928. The painting is thought to have been sent to Japan around 1931-34, based on a list of works compiled by the keeper of the Matsukata collection. According to the catalogue entry for the exhibition "The Collection of Mr. and Mrs. William Coxe Wright" (San Francisco, California Palace of the Legion of Honor, August 28-September 26, 1965, no. 28), the painting was lent to a 1934 exhibition entitled "Exposition du Japon," at the Musée Rodin, Paris, but the museum has no record of an exhibition in that year (letter of March 30, 2006, from Antoinette Romain, conservateur général du patrimoine chargée des sculptures; in curatorial file). 7. It is unclear whether Wildenstein acquired the work directly from Hōraishokusan & Co.; however, Wildenstein is known to have acquired a number of works from the former Matsukata collection in Japan in the 1950s. 8. Information from 1977 Dorrance Wright estate inventory by Carroll Hogan (registrar file).